As an aspiring young adult writer, I am so often drawn to the genre. Occasionally it reminds me that my scrappy notebooks and storyboard ideas are like soooo not going to cut in in this space. So as I delve into my latest book, I am at the same time thinking of my own tween years. It’s 1989, and the Warrandyte blue light disco is in full swing. I’m 10 years old and totally rocking it in a black and gold satin bubble skirt, complete with sleeveless denim jacket, bandana wrapped around my knee and superbly crimped ponytail. My fringe is teased with so much hairspray it looks as though a funnel web might emerge. And my Ma made me a scrunchie from the same material as the black and gold bubble skirt. Eat your heart out Joey Jerimiah! Kids are hugging the walls of the community hall, a sad looking DJ stands behind a couple of lights that are actually torches covered in red and blue cellophane, and my best friend leans beside me in her layered denim skirt, with slap bands on her arm. We scope out the canteen (I have enough money for a Fanta and two Redskins) then we rush to the DJ and request our song. After two hours, and Kelly’s 14 visits to the DJ to demand our song (she has always been persistent) my tongue is furry and orange, and the boys are still standing as far away as possible from the dancefloor. We’ve done jazz hands in the air, drawn our fingers across our eyes rhythmically and about to launch into the best part; ‘Say my name, sun shines through the rain…’ when our audience is distracted by some new arrivals. Let’s call them the Minogue sisters. Everyone rushes to say hi, to ask what they are doing there, and Kelly growls ‘keep going,’ as her back-up singers attempt to abandon the routine. The Minogues are impeccably dressed in matching fluro, fingerless gloves, LIPSTICK, and of course they can sing and dance too. So when everyone is on the dancefloor, following their lead and being ‘sisters doing it for themselves’, my dreams are shattered. They are so so good. And like, so much better than me. But I just want to be near them, to absorb some of their radness, and learn from their wisdom. So this was actually meant to be a book review, but here I am reflecting on a pretty significant core memory. Where I was reminded that despite my best intentions, there was someone more talented and popular and worthy of my childish envy. 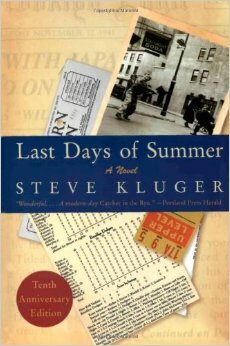 And as my little YA novel struggles away in a half scribbled notebook, with vague chapter outlines and more research to undertake, I open Last Days of Summer by Steve Kluger. My dreams are shattered again. There is no way I can ever write a story like this, not even almost as good. Together with Green, Zusak, Marsden and Rowling, Kluger becomes the Minogue to my dance routine. I’m so jealous of how rad he is, and want to absorb his talent through his words. But I know, in my heart of hearts, that a colour coordinated scrunchie and heaps of practice to perform probably won’t make me famous. In short: what just happened? This was supposed to be a book review. This entry was posted in Uncategorized on August 3, 2015 by jadetam.